Another snow day over here for me! I am so so so excited to be sharing Erin's baby shower with you today. The shower was a huge success, if I do say so myself. I felt so happy to be able to shower Erin, who has become one of my best friends in the last year or so. She is such a giving person, so it was nice having a chance to give back to her! I am apologizing in advance for the massive amount of pictures: Anna, a fellow hostess and blogger (see her blog here), had a fancy camera and took some beautiful pictures of the event. Most of the pictures in this post are hers and the difference between them and the ones I took on my iPhone is huge. If you recall from Friday's post, we pulled from Erin's nursery inspiration board (see that on her blog here), when planning the shower. We were going for a baby chic vibe with coral and gold as the main colors with blue & white accents. I found this gorgeous, Kate Spade-esque invite on Paperless Post (highly recommend, by the way), and we used that as a springboard for our planning. Anna wrote the welcome message on the chalkboard free-hand! These balloons were ah-mazing and came from Bargain Balloons. I did not realize how big they were going to be, but the size made them all the more fun! Anna even managed to get Erin's and Ryan's pups, Cotton and Mallie, in a pic! 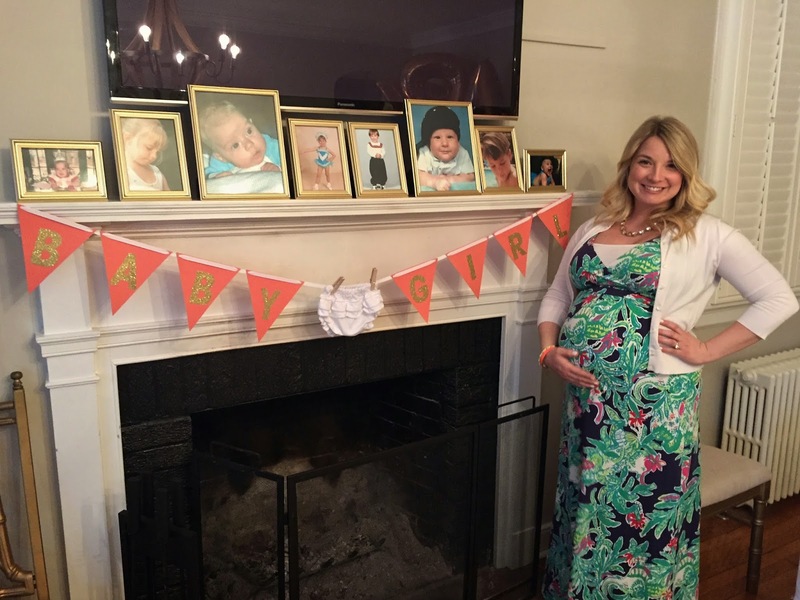 In this same main living room, I made a "Baby Girl" banner for the mantle and also got pictures of Erin and Ryan as babies from the soon-to-be grandmommies. I put them in gold Dollar Store frames and they were a huge hit! Adjacent to the living room is the dining room where we set up the drink station and food table. The drink station included a bubbly bar with champagne (we also had sparkling cider on reserve for the Mama-to-Be), juice, and berries, as well as lemon water. 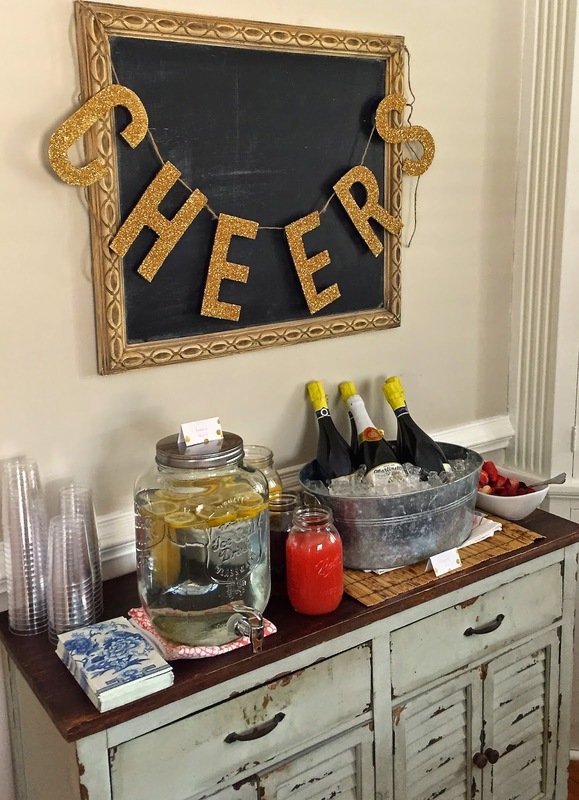 The "CHEERS" banner was initially used in Anna's wedding, but also fit our theme perfectly. On the table, we used Target wrapping paper as a runner and also decorated with the framed shower invite and pom poms that Sam, another hostess, made for the event. 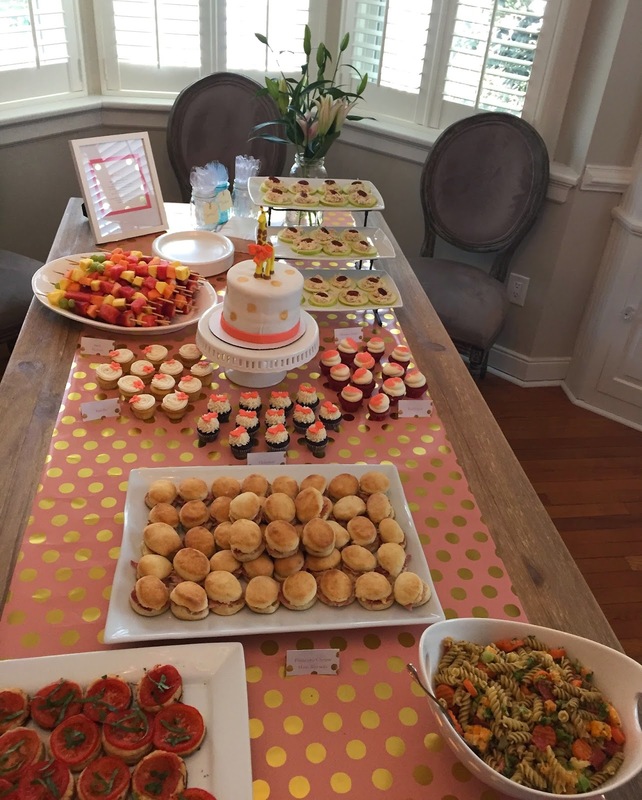 We served my pimiento cheese ham biscuits (recipe here), tomato tartlets, chicken salad bites, pasta salad, fruit skewers, and mini cupcakes. The real showstopper on the table, however, was the cake. I ordered through The Cupcakery of Richmond, a company started by my former teaching mentor, and cannot say enough good about Karen and her fabulous cakes! We served classic chocolate, classic vanilla, and red velvet mini cupcakes. The topper cake was peanut butter chocolate, Erin's favorite, and was for Erin and Ryan to share later. The giraffe was incredible (and so stinkin' cute)! Erin is freezing it with hopes of keeping it for baby girl's first birthday cake! Karen also made cake pops for the event which we placed by the front door as favors. The last area of the shower was Erin's sitting room where we had the gifts. The sitting room is off the kitchen and we placed the only activities of the shower in the kitchen en route to the gift table. We put out diapers and sharpies for guests to write funny or inspiring notes on diapers for Erin & Ryan to read during late-night changes. We also put notecards out for guests to write their address. While Erin opened her gifts, we recorded them on the back of notecards to make writing thank you notes a breeze. We used the round table in Erin's breakfast nook as a gift table. Sarah, another hostess, made the most beautiful dotted backdrop for the table out of scrapbook paper. She used a circle craft puncher and hot glued the circles to fishing line. Erin was so gracious and excited while opening gifts that it made showering her all the more fun. She got quite the loot! would make a great gift for a new mom with a sense of humor! After gifts, Erin gave guests a tour of the beyond gorgeous, nearly completed nursery. Erin is going to do a full blog post of the nursery on her blog Attention to Darling, but I couldn't resist sharing a sneak peek of the crib and these precious little Lillies! And, of course, we had to conclude the shower with some pictures! Erin with all of her hostesses! After the guests left, Erin also showered us hostesses with gifts as a thank you! 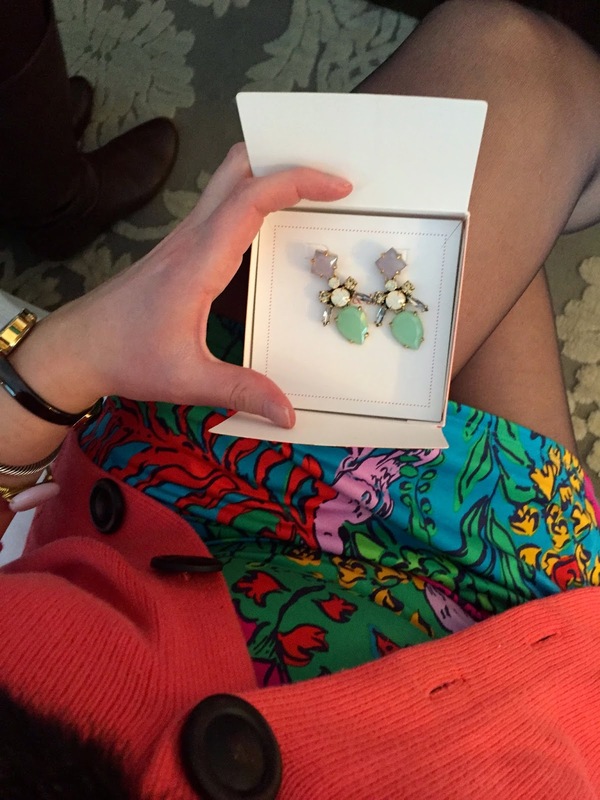 I am absolutely in love with the Stella & Dot earrings she chose just for me! god-brother asked if I was having a baby! Bahahaha, not anytime soon! Have you ever hosted a shower before? 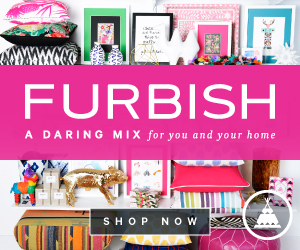 Labels: Celebrate We Will, Decorating, Entertaining, Ladylike, Lilly, Oh Baby! Everything looks great - I love that diaper idea too! So clever. Oh my! So much to comment on. I loved it all! The table runner (was it paper? i've heard of people using wrapping paper), the cake/cupcakes, the balloons. But I think my favorite was the confetti backdrop! That is so creative and I need to remember that for my future events! ;) have a great wknd! I love everything about this shower! The colors and details all came together perfectly! 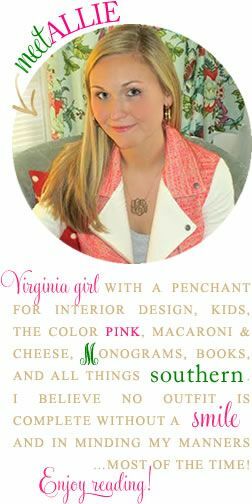 I'll definitely be using this as inspiration next time I host a get-together :) I just got those Stella & Dot earrings too - aren't they gorgeous?! Enjoy your snow day! I love the idea of using wrapping paper as a runner. It added so much to the table design. What a great idea to have all the guests fill out note cards with their addresses and then write what they gave on the back. So much easier for the mama-to-be! Gorgeous shower! Seriously not a detail went unnoticed! I loved the ballons and the wrapping paper - such little things that made quite the difference! You guys did SUCH a cute job! I'm definitely saving this post for future party planning ideas. Have a great weekend girl! What a beautiful shower! You all did a phenomenal job showering your friend with joy. That group picture is so cute too, and the story about your god brother is funny! You are such an amazing hostess! And the pimento cheese with ham biscuits?? Be still my heart! Wow!! What a beautiful shower!! You are such a great friend (and planner). Love all the details - you really didn't leave out anything! This looks so amazing! Beautiful shower with so many cute details; I'll remember these if I ever am hosting a baby shower - my friend had those balloons they were a hit at hers too! I love how you decorated for the shower! It's so gorgeous! I've never hosted a shower (I'm only 15!) but I do look forward to attending one when I'm older. Everything came out amazingly! I love the colors and the food spread looks absolutely amazing! She's so lucky to have such great hostesses and friends! Btw, do I spy Annaliese Trigler there?? What an awesome shower!! You've given me so many great ideas for future showers! Really love those balloons! You girls did an incredible job. 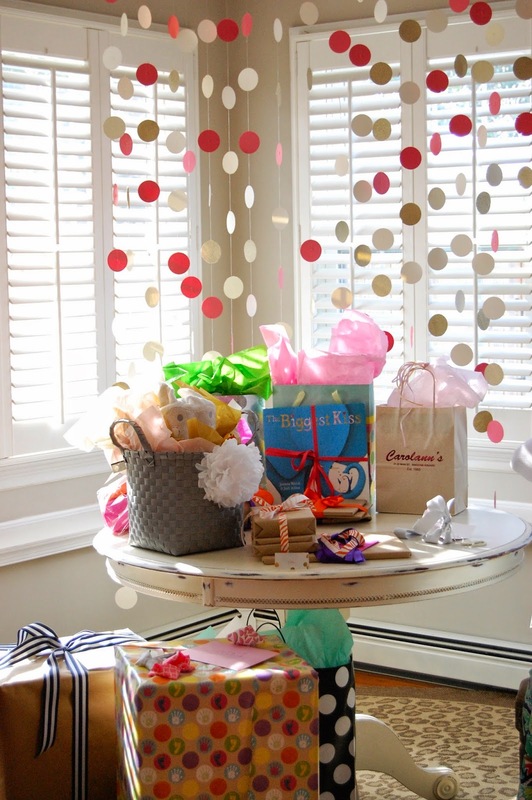 I love the idea of using cute wrapping paper as a table runner :) So creative.